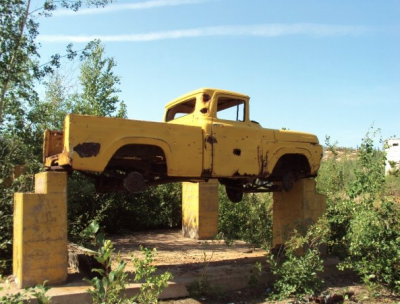 Sun Dogs and Yellowcake chronicles the short existence of Gunnar Mines, Saskatchewan, between 1952 and the closing of the mine in 1963. 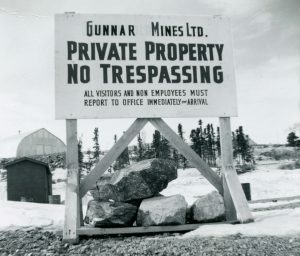 Entry to Gunnar was restricted due to secrecy regarding uranium mining. 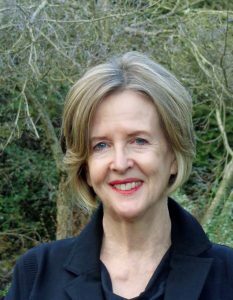 Patricia Sandberg photo. Patricia Sandberg recalls happily growing up in a boom town that was a key supplier of uranium in response to Cold War paranoia. 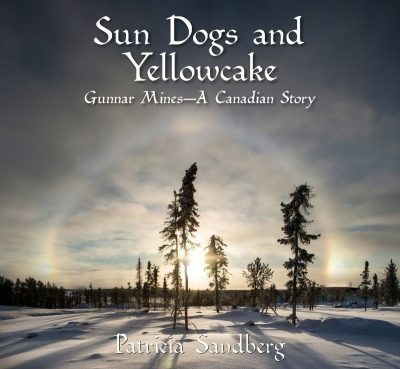 From Crackingstone Press in Surrey comes Patricia Sandberg’s Sun Dogs and Yellowcake: Gunnar Mines — A Canadian Story, a memoir of Sandberg’s 1960s childhood in the northern Saskatchewan town of Gunnar Mines. It’s one of those independently-published books that won’t sell a ton of copies, and yet a strong argument can be made that its appearance is vitally important. It recognizes an epoch of Canadian history that would otherwise have been buried–literally. Although the remnants of the town’s open pit mine, uranium mill, acid plant and toxic tailings are no longer visible, the remote industrial wasteland upon which Gunnar Mines once thrived is still undergoing cleanup efforts at an estimated cost to the Saskatchewan taxpayer of $260,000,000. Yes, that number is correct.– Ed. 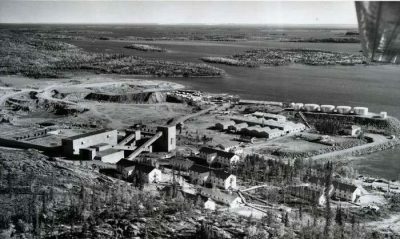 Gunnar Mines was a doomed little town that produced the essential ingredient for the mechanics of doom–uranium. It was a tiny town with a short shelf life that cashed in on the paranoia of the Cold War and the certainty of Mutually Assured Destruction politics. This otherwise quintessentially Canadian town of the baby boom era, with its curling rink, bake sales, Christmas pageants, pickup hockey, and vital sports fishing, might otherwise have passed for a model of co-operative co-habitation and social engineering. It might seem, according to this finely written and fully illustrated book — Sun Dogs and Yellowcake, by former securities lawyer and ex-Gunnar Mines resident Patricia Sandberg — that the town barely existed at all, so distant are our memories of pioneer spirit and communal accord in such transitory subarctic mining settlements. Sandberg commingles a memoir — including of photo of herself as a cute child making cookies, rolling out dough in a raw plywood kitchen — with research into the nature of the mineral that acted as the town’s engine and motor: uranium. 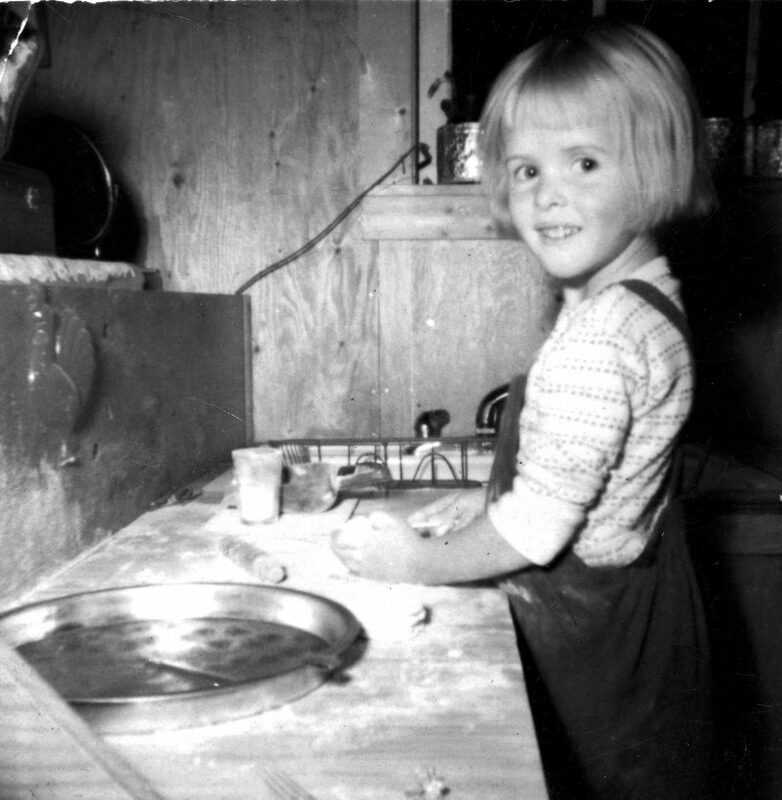 The author Patricia Sandberg at age four making cookies in the family shack beside the lake. Hence the title. Yellowcake is a concentrated uranium powder obtained during the processing of uranium ore. A sundog, or mock sun or parhelion, is a startling atmospheric phenomenon caused by the interaction of ice crystals and light in the atmosphere. Gunnar Mines had plenty of both. From the beginning uranium was a conundrum, a puzzle, a shrouded mystery rock: an ore with magical powers defying the comprehension of the everyman, but mined in circumstances where the everyman was left to hew the wood, draw the water, and dig for the mineral. Gunnar Mines — the epitome of isolation, accessible by air year round and by ice road across frozen Lake Athabasca in winter — was such a place, a stop along an atomic highway all but vanished in our age of air transport and post-nuclear energy solutions. 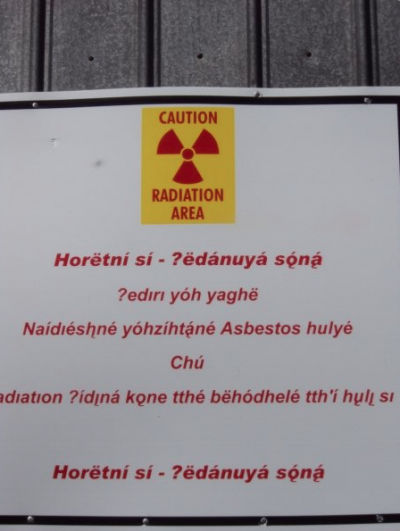 Not many books get written about the Cold War era of instant towns in isolated places. One of them, The Highway of the Atom, by Concordia University professor Peter C. van Wyck (McGill-Queens, 2010) gave an informed take on the whole situation. It is a cultural epoch that fast recedes, even in these nuclear-paranoid and politically uncertain times when a mere suitcase could carry a pocket nuke. How many of us still know what is referred to by the acronym DEW? The stories of Distant Early Warning line sentinels may well evaporate in the imagination of Fortress North America without the occasional tome such as Sun Dogs and Yellowcake to evoke these most alarming of single-industry towns (SITs), makeshift, toxic, and emaciated frontier industrial zones that serviced uranium production and prepared for the singular events of the mid-twentieth century, the mere bagatelles of world conflagrations, H-bombs, and geo-political board games. Heading to the Hudson’s Bay store in iconic Hudson’s Bay store coats. Therefore it is a scarce research pool into which one dives in search of on-the-ground remembrances, analysis, history, or celebration. Herein lies a major value of this book: it provides a singular document telling, largely in the voices of those who were there, of a place and time unlikely to be retold, repeated anywhere else, or revived once forgotten. 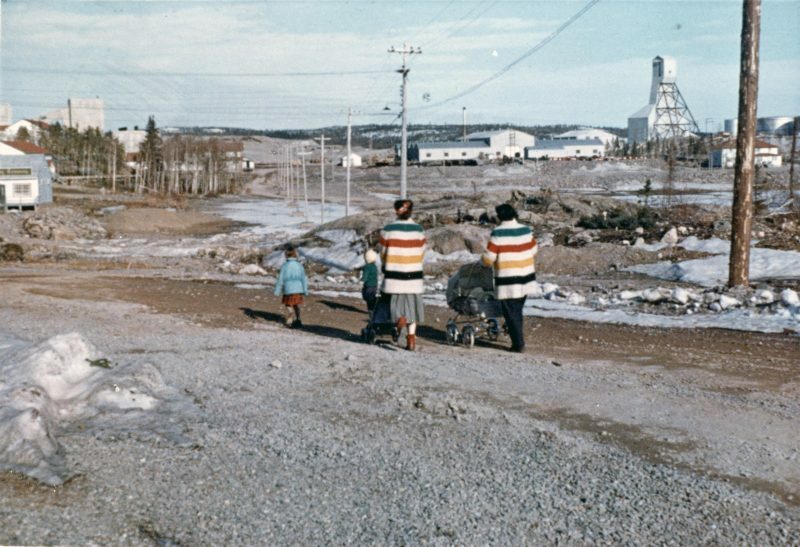 There might even be a perverse patriotic value in revisiting the familial traditions of this northernmost extension of the postwar and baby boom era, when Canadians from the south explored, accessed, and colonized the north in the most focussed and time-sensitive of settlements. Sandberg, in turn, mines the detritus of human interest: ripping yarn adventures, lake rescues, underground toil, and prospecting revelation, with a cast of barge men, pilots, and grizzled individualist characters with unlikely names like Chesley Nutkin. She draws in these human strands to resurrect a joyous community of family and friends glad at having weathered the Great Depression, survived the big war, and found well-paying jobs. Much of Sun Dogs and Yellowcake is a celebration of a particular brand of spiritual relief, the furlough of the Greatest Generation, the time they got paid off for all their hard work, sacrifice, and fear. In short, this was a generation that could finally see a future – but it would not be in a company town on the Crackingstone Peninsula in the Beaverlodge Uranium District on the north shore of Lake Athabasca. 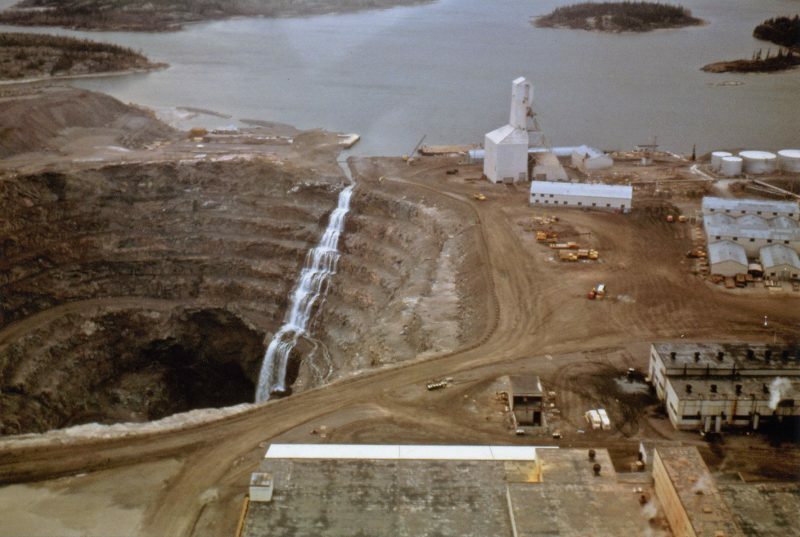 Water flows from the lake to begin the long process of filling the open pit mine to prepare for abandonment. Sandberg photo. Under the circumstances of a certain kind of boom and bust, it didn’t matter terribly that they were conveying the stuff of mass destruction to the sinister world of the military-industrial complex. Indeed it was a time of environmental oblivion. Sandberg describes the emptying of wheelbarrows and drainage pipes of various effluents into pristine northern waterways, along with oil machine leaks, asbestos, soot and ash. Slag mountains were bulldozed into clean lakes and herded into soccer fields with measurable radiation readings above ground. This appalling wasteland extended to the community. A bear that would not leave summarily executed. 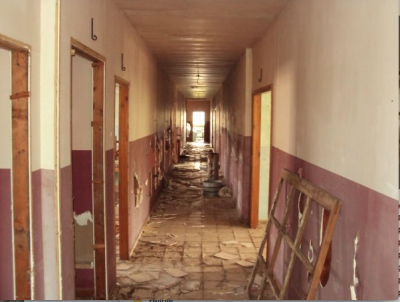 Twelve-year-old kids roamed the wilds with .22 rifles killing everything. Ah, the 1950s. The book is thus, among other things, a tale of conspicuous natural consumption. Did the vastness of the landscape loosen the human ethic of neatness and conservation? Vignettes abound of adventuresome, bold, innovative, and sometimes stupid men doing crazy things. Like using frozen Lake Athabasca as unintended winter storage for cars that fell through the ice. Like trying to haul an entire hospital across the thinning ice of the lake to set it up in another town but forgetting to check the calendar. A job that would be possible in February turns into a wasteful nightmare in May. 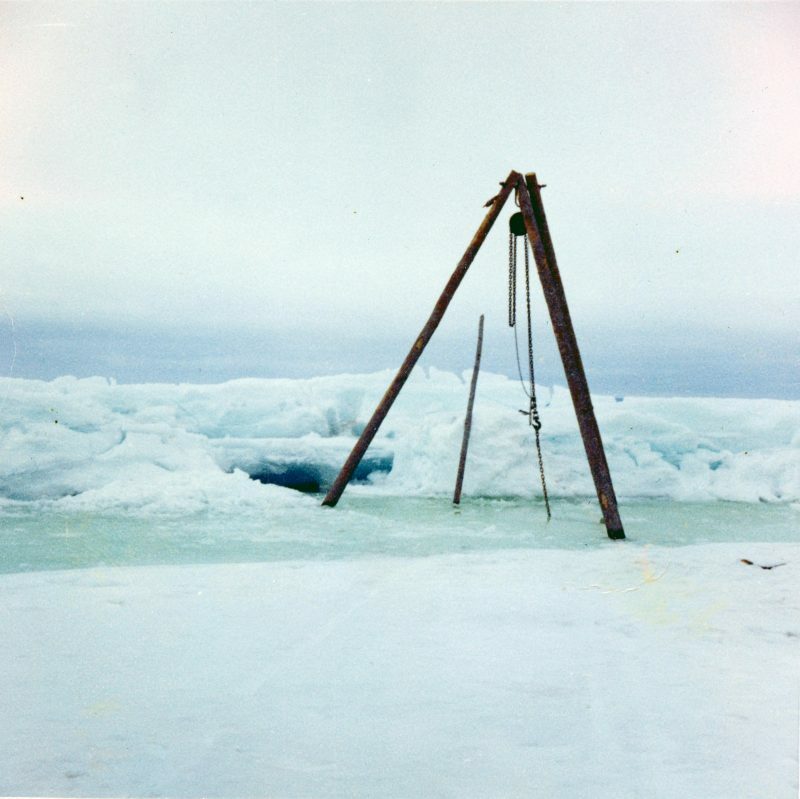 A car remained submerged for months, held with a tripod and chains. Sandberg photo. The book conveys an odd time disconnect, as if the residents, as centric as the community had to be, given its singular geography, had developed a special schedule just for them. Sun Dogs and Yellowcake also gives the sense that in the north — shrouded in near darkness for most of the day for half the year — time was less relevant than what season it happened to be. Situated in the extreme subarctic north of Saskatchewan on the frozen edge of Lake Athabasca, the town was both foreground and background to Dr. Strangelove territory. The people of Gunnar Mines looked up to see the fly-over routes for the B-52 Strategic Air Command, with warbirds constantly in the air in anticipation of a planet-ending conflict that the world powers were determined to fight at least to a mega-death draw. 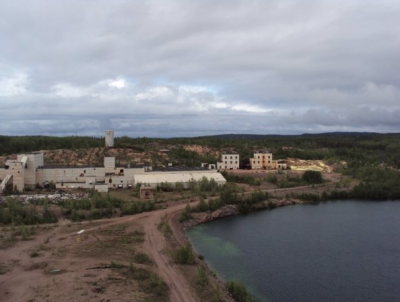 BELOW: SOME PHOTOS (2009) OF GUNNAR MINES COURTESY OF JOE ABERCROMBIE, PRECEDING $260 MILLION CLEAN-UP EFFORTS THAT HAVE EFFECTIVELY ERASED THE TOWN. The Ormsby Review is hosted by Simon Fraser University. The Advisory Board consists of Jean Barman, Wade Davis, Hugh Johnston, Patricia Roy, David Stouck and Graeme Wynn.